Then I removed the front bumper using the instructions from the “How-to: Remove front bumper and remove chin” (this is NOT optional, you have to remove the front bumper to install the filter and to plug the airpump hose, dont worry, it’s easy to do…) Remove the battery. Next unplug the vaccum tube that goes from the airbox to the small “T” connection. Cap the “T” connection with the supplied 3mm cap. Tiewrap the hose to a safe place. Disconnect the VSV (orange plug). 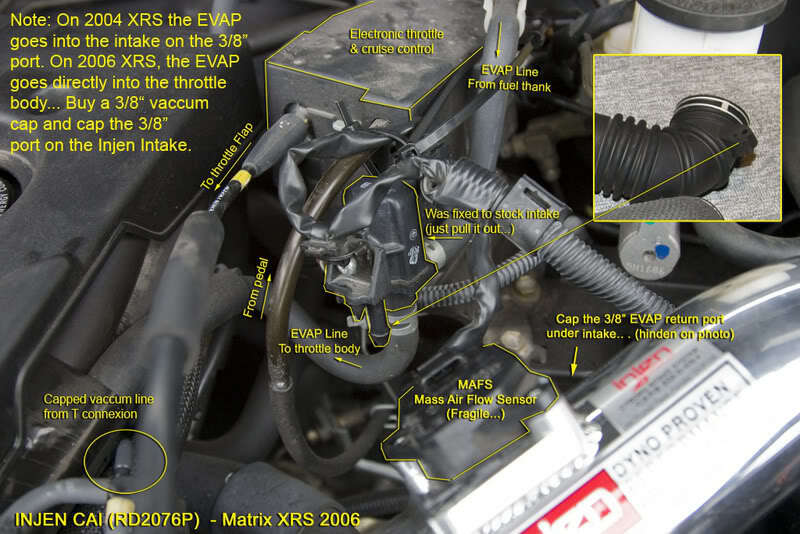 Then Locate the EVAP Line at the back of the airbox (3/8″ tube going through an electronic switch then to the throttle body) Leave it plugged like it is cap the 3/8″ port on the CAI. 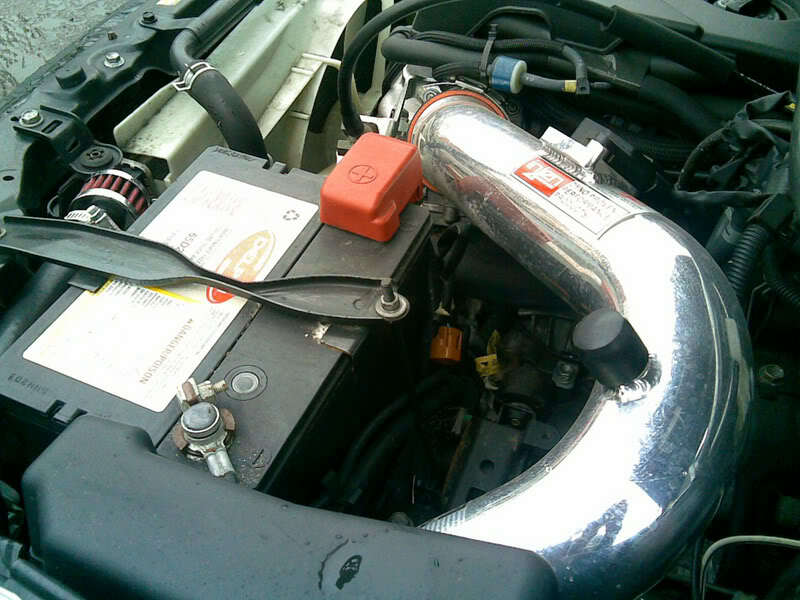 The switch for the EVAP line is fixed to the stock air intake, pull upward to release it for its rubber hold. Tiewrap it to a safe place. Next remove the stock airbox (top AND bottom part) and tubing near the headlight. Be carefull with the MAFS Sensor, its fragile, I left it in the stock airbox until the end of the installation to be sure I dont damage it. Install the spacers for the fuse box. 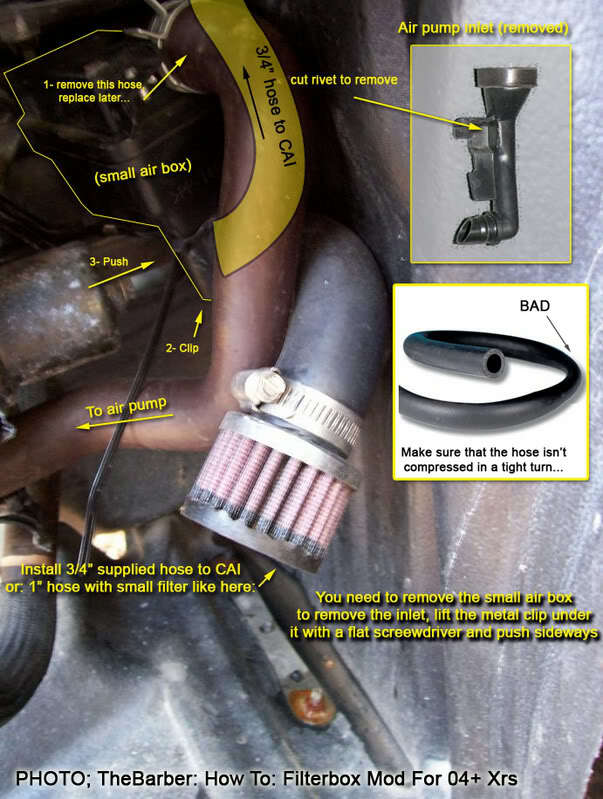 Install the CAI, the filter. Carefully install the MAFS in the CAI, use stock srews. Now the part a little more tricky, the air pump air box hose connection. Locate the small air box in the bumper area near the front driver side wheel. Unclamp the top hose. 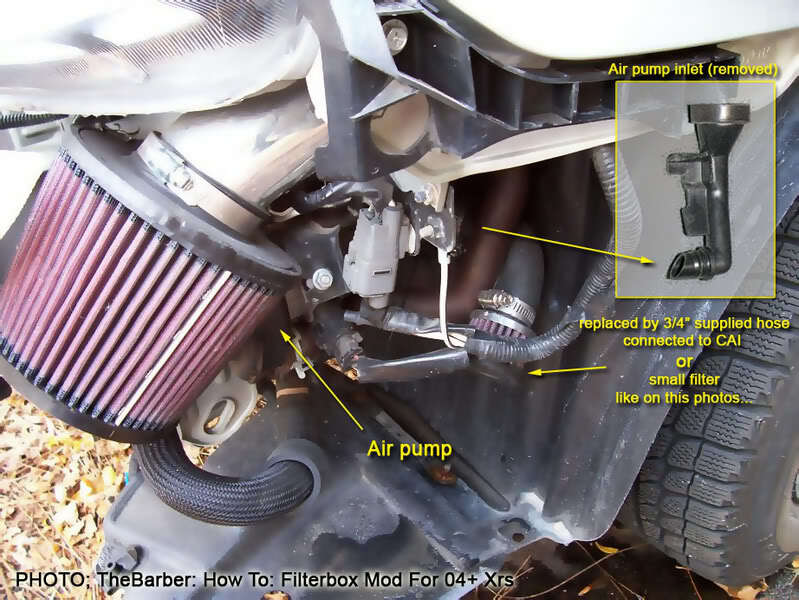 You will need to remove the air box from its location to modify it, there is a metal clip under it, you need to pull the metal tab downward with a flat screewdriver and and slide air box to the right (toward the rear of the vehicule). 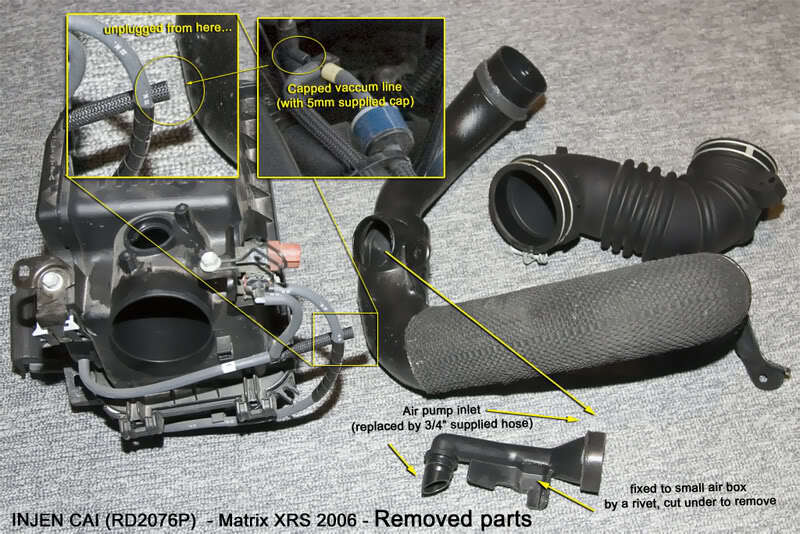 Now you will need to remove the little air inlet from the small air box (plastic pipe pointing upward). To do this, cut the rivet from below and remove it. Now take the 3/4″ hose supplied with the CAI and slide it inside the bottom hole, make shure it goes in at least half an inch. 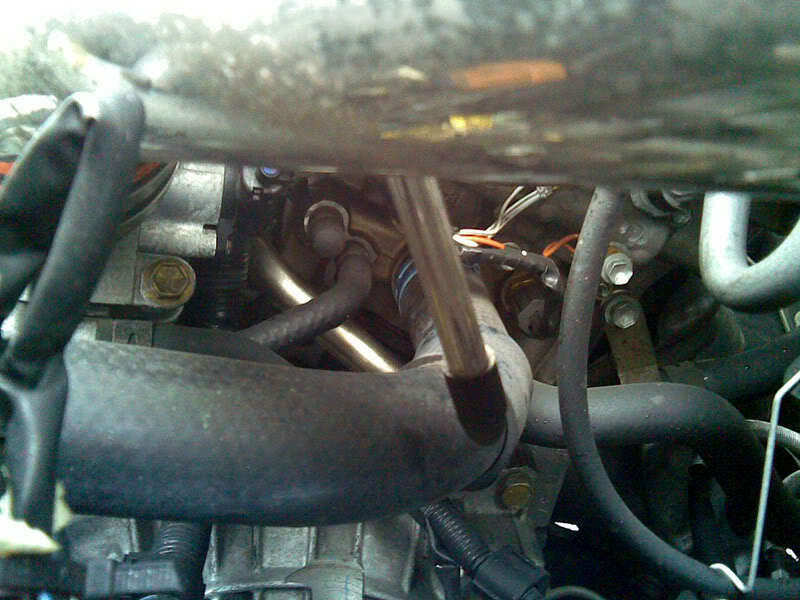 Use electrical tape to secure the hose to the small air box. Now put the air box back in place and reconnect the hose that was disconnected earlier, the one that goes to the air pump. 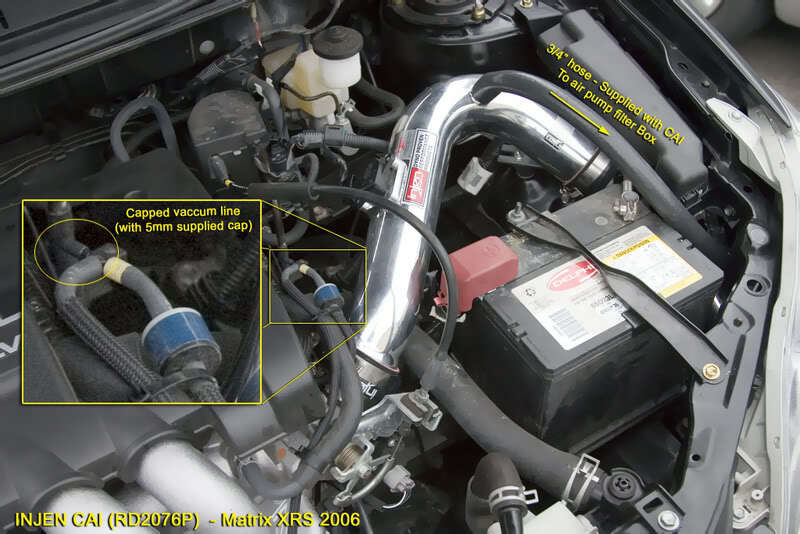 Slide the other end of the 3/4″ hose back into engine bay, install small air filter at the end, tie-wrap hose in a safe place, cap the 3/4″ port on the CAI. Make shure the hose doesn’t get compressed in a tight turn. Double check everything to be shure that every part is securely tighten. Reinstall battery and front bumper. Start engine and let idle until RPM goes down under 1000RPM. 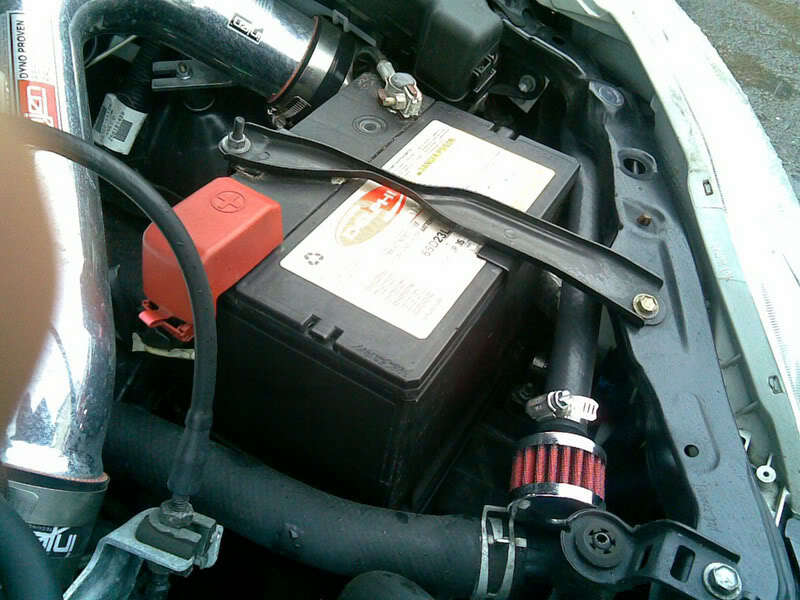 When the engine is cold, you will ear the airpump running and the intake will do more noise than usual, this is normal. When it gets to normal temperature the noise is pretty close to stock… Until you step on it….! Go for a ride and enjoy… it take about 45min to 1h to do the install.